You'll both appreciate 8 months of continuous flea and tick protection. Cats are independent by nature, but they still need your help with flea and tick protection. 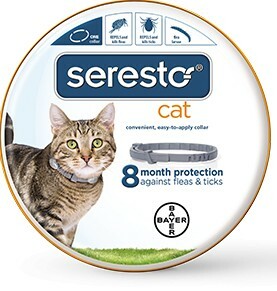 Seresto® for cats is designed to be a convenient way for you to help protect your cat from fleas and ticks that can cause bites. Our innovative Sustained Release Technology provides protection from fleas and ticks for 8 continuous months in each non-greasy collar. That's one easy-to-use collar instead of 8 monthly treatments.